Greek Deputy Finance Minister orders transfer of public accounts to the National bank of Greece. Greece might be able to skip next months IMF payment. PMI and Durable goods decline. Manufacturing implodes as the Baltic Dry Index declines. During BRICS summit Russia wants IMF reforms. IMF says yuan no longer undervalued. Bernie Sanders exposes CEO’s that pay no taxes, outsource jobs and received government bailouts. US and Russia prepare for Arctic Drills. US blocks nuclear disarmament in the middle east. Turkey and US agree to air cover for the FSA. US and NATO re-positioning military assets and are preparing to bring in troops to the middle east. US getting ready to take out Assad. As Greece is running out of funds, Greek deputy finance minister Dimitris Mardas ordered the transfer of 1,039 bank accounts of public authorities in a special account in the National Bank of Greece (NBG). The transfer of funds should be completed by June 5th, the day that the Greek government has to pay its next installment to the International Monetary Fund. He accused European ultra-liberals of forcing a free-exchange regime on the Eurozone and EU countries, which he said is detrimental to their economies. US Services PMI has slipped the last 2 months, back to the lowest since January. 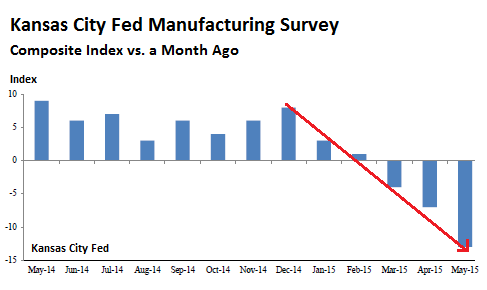 At 56.4, below expectations, this is the biggest 2-month drop since December. After dramatically upwardly revised data from last month (but following an even more dramatic downward revision to all historical data earlier in the month) – the highly noisy series of Durable Goods Orders printed -0.5% (from +5.1% in March, revised up from +4.0%). Capital Goods Orders (non-defense Ex-Air) beat expectations MoM (printing +1.0% vs 0.3%) and was revised remarkably up from the biggest drop since 2012 to a 1.5% rise in March. Core Capital Goods Orders, however, remains negative YoY for the 4th months in a row. 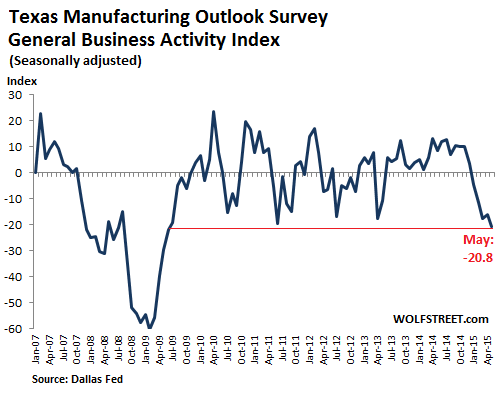 The last time this happened was either a recession, or the Fed unleashed QE3. many manufacturers in Texas, Oklahoma, New Mexico, and a number of other states, life is getting tough. Kansas City Fed reported last week, and that’s what the Dallas Fed reported today. “Labor market indicators reflected employment declines and shorter workweeks,” with only 12% of the firms reporting net hiring, but with 21% reporting net layoffs. Primary Metal Manufacturing: “Imported steel continues to be a big problem in Houston, but it is also negatively affecting volume and pricing in the entire country.”Fabricated Metal Manufacturing: “We don’t feel confidence anywhere, Wood Product Manufacturing: “We sell to new single-family home builders. Wet weather has slowed down the development of raw land into ready lots and the home construction process as well. manufacturing only accounts for 12% of the US economy, after manufacturers spent decades offshoring much of their labor content to cheap countries. week ending on May 16th declined -1.5%. This marks the fourth consecutive week that mortgage applications have declined. The four week average has now declined from -2.02% to -2.97%. as the nation’s unemployment rate continues to trend along below 6% more American’s will be enabled to obtain a home loan. The coming Capital Controls are designed to protect the banks from YOU. if 10% of people hit their breaking points and withdrew their money in cash– there wouldn’t be enough cash in the system to support this demand. And the banks would subsequently collapse. This is a major reason why they’re trying to get rid of cash, and in some cases even criminalize it under the ridiculous auspices of the war on terror. When a government is bankrupt, the central bank is nearly insolvent, the banking system is illiquid, and an entire population suffers from interest rates that are either negative or below the rate of inflation, capital controls are a foregone conclusion. They’ll hit just as soon as enough people reach their breaking points… when they say ‘enough is enough’ and they take their money out of the banking system. China and Chile on Monday signed a host of cooperation deals including a multi-billion dollar currency swap pact as the two countries move to enhance their trade and financial ties. they signed a series of bilateral business contracts and governmental accords in areas including politics, trade, finance, mining, agriculture, production capacity and science and technology. Development of China’s cross-border transaction has been speeding up. The International Monetary Fund no longer believes China’s tightly controlled currency is undervalued, an IMF official said Tuesday, a stance that might help Beijing in its wrangling with Washington over exchange rate controls. The IMF’s first deputy managing director, David Lipton, also said Beijing should work toward having a floating exchange rate in two to three years. The United States has long accused of China of suppressing the value of its yuan, giving its exporters an unfair price advantage and hurting foreign competitors. Sen. Bernie Sanders fired back at 80 CEOs who wrote a letter lecturing America about deficit reduction by released a report detailing how 18 of these CEOs have wrecked the economy by evading taxes and outsourcing jobs. Sen. Sanders released a report that detailed how 18 of them have helped blow up the deficit and wreck the economy by outsourcing jobs and evading US taxes. Many of the companies also have outsourced hundreds of thousands of American jobs In other words, these are some of the same people who have significantly caused the deficit to explode over the last four years. Here are the 18 CEO’s Sanders labeled job destroyers in his report. Eighteen of the 80 CEOs who signed the call for deficit action are actually some of the biggest outsourcers and tax cheats in America. “The US still has troops in Afghanistan and plans to keep them there for years. And they have fomented wars in Ukraine, Africa, Syria, and now Yemen. The Iran Nuclear Review Act of 2015 was signed on Friday. The legislation overwhelmingly passed the House of Representatives and Senate earlier this month. The measure will allow for a 30-day review of any final nuclear deal with Iran. During the reviewing period, Obama would be able to waive those Iran sanctions, which were imposed by the executive branch. However, the president would have to leave in place sanctions that Congress had previously drafted. The bill would also force the Obama administration to certify, on a regular basis, that Iran is abiding by the terms of any nuclear deal. Secretary of the Russian Security Council has said it’s necessary to build up cooperation in the military and technical field and in the fight against terrorism within the BRICS countries (Brazil, Russia, India, China and South Africa). “I am convinced there is a need for increased cooperation between our countries in such areas as military and technical cooperation, joint struggle against terrorism, extremism, separatism, cross-border crime as well as in countering new challenges and threats,” . The white paper China’s military strategy was issued by the State Council on Tuesday, signaling ambitions for greater naval presence in the region where tensions are rising over disputed territories in the South China Sea. “The [People’s Liberation Army] Navy (PLAN) will gradually shift its focus from “offshore waters defense” to the combination of “offshore waters defense” with “open seas protection,” and build a combined, multi-functional and efficient marine combat force structure,” says the document. The new Boomerang unified wheeled platform will serve as the basis for a whole new family of combat and auxiliary armored vehicles. Pantsir S-1 is a combined short to medium range surface-to-air missile and anti-aircraft artillery system using phased-array radars for both target acquisition and tracking. More than 4,000 troops from six NATO countries and three non-member states began a major air exercise over far northern Europe Arctic Challenge is to last two weeks and involves more than 100 warplanes from the United States, Britain, Germany, France, Norway, and the Netherlands, all NATO members, plus Sweden, Finland and Switzerland. The US Air Force will contribute 12 F-16 jet fighters as well as AWACS radar aircraft. A U.N. official, who was not authorized to discuss the matter publicly and therefore also spoke on condition of anonymity, confirmed that the talks would be postponed. The setback came as Saudi-led warplanes on Monday pounded Shiite Houthi rebel positions in the capital and across the country. A spokesman for the Iraqi government says U.S. Defense Secretary Ash Carter has been given “incorrect information” following his criticism of its security forces over the fall of Ramadi to ISIS. Saad al-Hadithi said Monday that the Iraqi government was surprised by Carter saying Iraqi forces lacked the “will to fight” during the Ramadi battle. Al-Hadithi added that the fall of Ramadi was due to mismanagement and poor planning by some senior military commanders in charge of Ramadi. The two countries agreed in February to train and equip up to 15,000 Syrians under the $500 million U.S. program designed to add a credible ground force to an air bombing campaign against the militant group. The truth is that the United States has been funding ISIS all along and that the terrorist organization would not exist were it not for its being created by American intelligence agencies as far back as the 1970s under the name Al-Qaeda and Mujahadeen. Looking to boost Iraqi fighting forces, President Barack Obama said the U.S. and its allies need to examine whether they are deploying military assets effectively against Islamic State militants as Iraq mounts a new offensive to recapture critical territory west of Baghdad. the Islamic State in Iraq and Syria and the turmoil in Libya have forced NATO to look south as well as east in the alliance’s mission. Obama said the upheaval in the Middle East and the “increasingly aggressive posture that Russia has taken” in Ukraine has created a “challenging and important time for NATO.” He said NATO would continue to support Ukraine.. Earlier it was reported that Washington and Ankara have reached a preliminary agreement to provide air support for Syrian rebels trained in Turkey under a joint program with the United States. According to the Syrian Deputy Minister, such statements on the part of Ankara are direct evidence that Turkey intends to provide ‘direct financial and military support to the terrorist groups fighting in Syria’, hence prolonging the crisis causing the death of more innocent civilians. “We know what is going on now, say, in the Middle East, in North Africa, we know problems connected with the terrorist organization that arrogated the right to be called ‘the Islamic State’,” Putin said. “But there was no terrorism in the countries where it is active now until a totally unacceptable outside interference, which occurred without United Nations Security Council sanction, took place,” he said.